In our #AMreport today at Women’s College Hospital, we reviewed a case of focal lymphadenopathy which turned out to be sarcoidosis with pulmonary manifestations. Below are the take home points on head and neck lymphadenopathy, biopsies and pulmonary sarcoid. Biopsy of a localized lymph node should be expedited in patients where a node has persisted for more than four weeks and is associated with systemic features concerning for malignancy. 2. 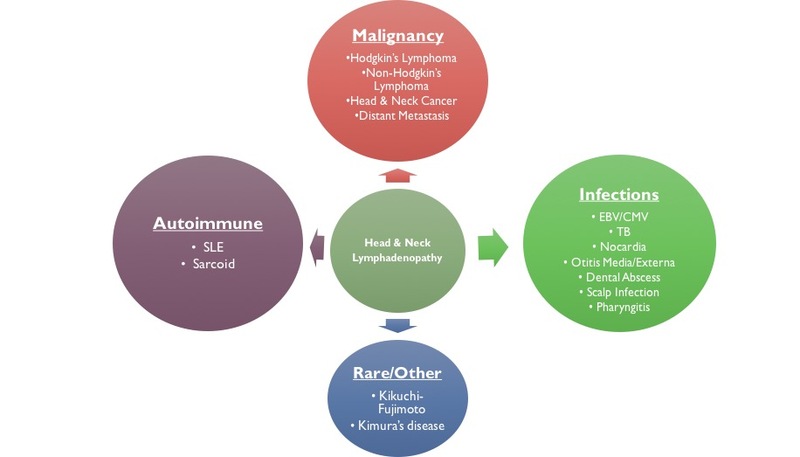 Simple Approach to Head & Neck Lymphadenopathy causes include but is not limited to: Infectious causes; Cancer; Autoimmune; Other/Rare. 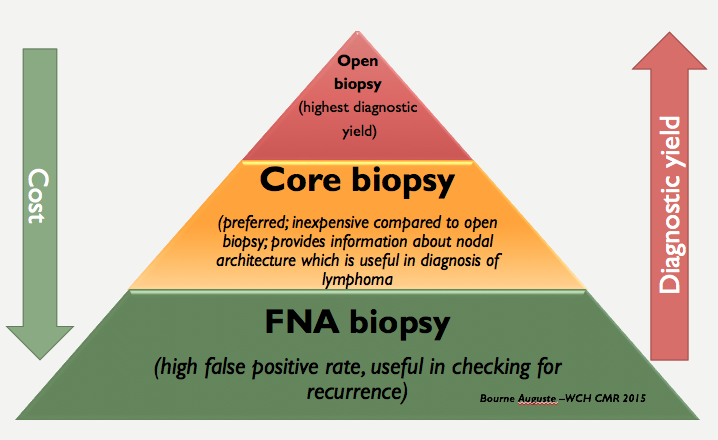 Core biopsy is useful in terms of cost-effectiveness as it gives you details about microarchitecture and does not have as high a false positive rate as FNA biopsy. The microarchitecture is important for histologic classification and plays an important role in determining treatment regimens particularly for lymphoma. This pyramid highlights that with an open biopsy the diagnostic yield is high at the expense of cost. However, core biopsies can give you some idea of microarchitecture but less expensive. If you are suspecting lymphoma then proceed with a core biopsy. An FNA is useful in checking for recurrence. Stage II: Bilateral hilar adenopathy and reticular opacities (upper lung zones usually). Stage III: Reticular opacities (upper lung zones) with shrinking hilar nodes. Stage IV: Reticular opacities with evidence of volume loss, predominantly in the upper lung zones; can have conglomerated masses with traction bronchiectasis, as well as calcification alwong with cystic formation. Apart from biopsy BAL washings are useful in determining diagnosis. ~100% PPV for sarcoidosis if: CD4:CD8 >4:1, lymphocyte % >16, biopsy showing non-caseating granulomas. Most patients with pulmonary sarcoidosis do not require treatment. 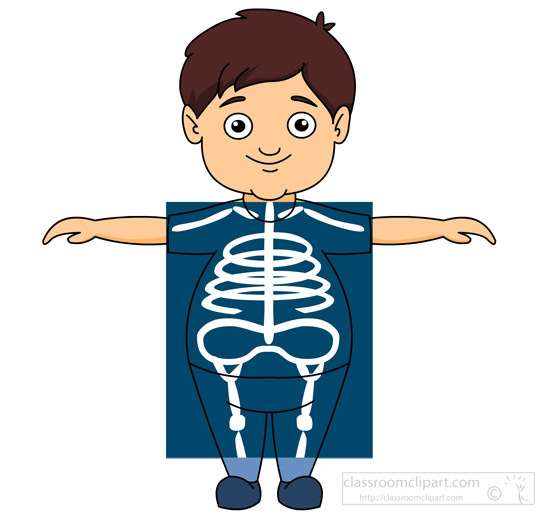 As a general rule thumb if organ function is threatened then implement glucocorticoid therapy. Usually treated for 3 months and then response to therapy evaluated. If no response after 3 months then alternative therapy with other immunosuppressants should be considered (methotrexate/biologics). If positive response after 3 months then steroids are tapered to a dose of 5-15 mg daily and treated for a further 9-12 months. Treatment should be coordinated in consultation and close follow-up with a respirologist/rheumatologist.